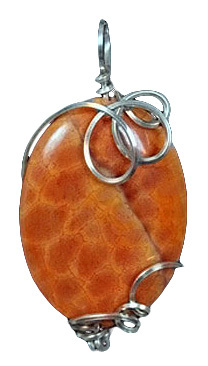 This "fire agate" bead is a brighter and more intense burnt umber in color, cut into an oval shape and measures 30 mm x 22 mm. Wrapped in sterling silver wire. Finished size is 45 mm x 24 mm. Weight is 0.3 oz.